Subaru ambassador, Dean Herridge, will contest the Bathurst 12-Hour on February 10, looking to go one better than the second placing he achieved in the production class in the endurance race last year. Dean, who made his name in motorsport driving the WRX STI in gravel rallies, has become one of the country’s leading tarmac racers, having won the Australian Targa Championship and competed at the Bathurst enduro four times, including the past three. In 2013 he’ll be in action in his Subaru Genuine Parts supported WRX STI, along with his Maximum Motorsport team drivers, John O’Dowd and Angus Kennard. 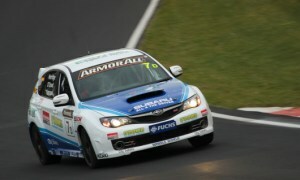 “I’m always excited to be heading back to Bathurst for the 12Hour as each year it gets bigger and bigger,” Dean said. Well the car has been loaded on the truck and is now on its way from Perth to Bathurst. The excitement begins! This year’s Bathurst 12 Hour has over 50 teams entered, which should make every lap an interesting one. The field is made up of plenty of big names and cars, however our team is focused on the Production Category. The plan? To fend off all the BMWs, Fords and Holdens, taking our Subaru to the top step of the podium. Interesting to note that there is not one Mitsubishi Evo in the event. John O’Dowd and Angus Kennard will join me again to share the driving duties, our third year together. Both John and Angus have years of Targa experience and John has been competing in a Maximum Motorsport Subaru with great success in the WA Rally Championship for the last 3 seasons. The team have worked very hard since the new year to prepare the STI for this years event, including a complete refresh of the engine, clutch and drivetrain and also upgrades to the front brake package. One of the biggest challenges is that all the Production teams will run on slick tyres. This is not only the first time at the 12 Hour, but the first time that Maximum Motorsport will run a car on slicks. We will have plenty of things to sort out during the practise sessions on Friday and in qualifying on Saturday. Luckily we have the support of Pirelli to assist us. They’ll look after our tyres and help us make sure the set up is well-balanced, which is important for an endurance event like this one. In all Targa and previous 12 Hour events that we have campaigned, we have always had to run an “R” Spec tyre–basically a cross between a race and road tyre. All our data over the years is based on this style of tarmac tyre, so this switch to slicks will definitely keep us on our toes all weekend. Trashing around a track like Bathurst for 12 hours is a tough challenge for any Production vehicle, and this year will be no different as the new tyres alone will put extra strain on wheel bearings, brakes, suspension because of the extra grip and forces that we expect. However I think the STI is up to the challenge and I can’t wait to drive it around Mount Panorama with its new set of “boots”. This entry was posted on Wednesday, February 6th, 2013 at 11:11 am. Please send me the Maximum Motorsport newsletters as they become available.